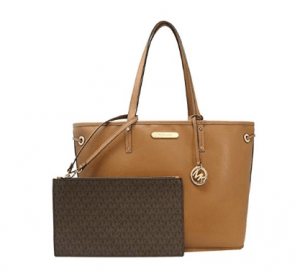 Michael Kors Large Drawstring Signature Tote Purse is offered in black and brown colors that have slightly different features, sizes and a 12 dollars price difference. The black bag has the leather draw string on the left and the right sides and includes the MK Signature clutch. This black Michael Kors weighs 2.34 pounds and measures 14” (bottom L) – 18” (top L) x 12”H x 5“D. The brown tote purse weighs 1.75 pounds and measures 16″ (bottom L) – 17″ (top L) x 12”H x 6″D along with a 10” double shoulder strap drop has the MK signature PVC and the detachable leather pouch that measures 11 x 7 inches. The open top has the drawstring closure on both sides and you’ll find a gold tone hardware Michael Kors logo at the front. It has a subtle classic monogram look and the dual rolled leather handles with a 4-inch drop and the round logo hanging adds a nice touch. The tote is reversible and you’ll get the saffiano leather on the other side as compared to the Signature logo exterior that you see in the photos. These are hundred percent authentic, guaranteed Michael Kors bags even though you may see the logos as uneven or flipped around in the photos. And the customer support is able to send the actual photos of the bags in the brand new wrapping. Customer reviews online are mostly positive, except for a defective unit someone received and the lack of a drop-down logo. Please note that the black bag doesn’t have that logo but the brown bag does. It is shipped all packaged and pretty quickly via Amazon.com. And you should receive it usually within a couple of days of your order. There aren’t any pockets inside of this bags but have pretty spacious interiors to carry your laptop and other belongings. In terms of size you can compare it to the LV Neverfull GM bag if you’re familiar with it. You can flip the bag inside out and no uneven stitching will show. It would have perhaps been nice to have a magnetic button or a zipper at the top to help keep the bag shut. But otherwise there is not much wrong with these bags. You’ll get them on time and in one piece as they are well packaged. It is a large bag and can be folded a little to fit in the packaging but that’s OK as the appearance won’t be affected. Michael Kors Drawstring Signature Tote is a very good quality bag with a premium look and feel, and that is easy on the eyes, at a reasonable price. Overall it is a great buy at a reasonable price for what it is. We certainly recommend it at the current price at Amazon.com.